When we searching at Google Search or any other Search Engine we mostly look at the Search Engine description for make sure that topic was the right choice for us . So we must set our blog description well understand for our viewers , If your blog Search Engine description was bad then you will lost the almost 80% of your Search Engine visitor's . In Blogger there is a special option for setup Search Engine description . 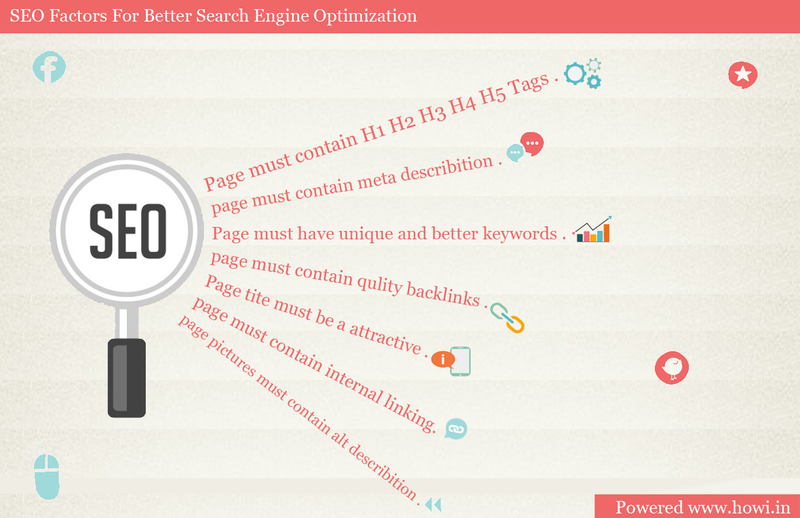 Through this article you will learn about "How to enable search engine preference and make your blog more SEO friendly . Login to your Blogger A/c . Enter to the Blog which you want to enable the Search Engine Preference function . Click on the "Settings" Tab . Click on the "Search Engine Preference" . On the "Meta tags" Tab you can see the "Description" Enable that function . You can also set Search Engine Description for each and every post that you created through Blogspot blog by the following method . After enabling the Search Preference by using the first step that i explained in this article follow the method . On the left sidebar of the posting area you can see a new option enabled "Search Description" . Enter the text which you want to show on the Search Engine for the article in 150 words and click on the "Done" Button . You are done . By enabling this option you can attract more visitors to your blog , If you not enable this option then the Search Engine automatically show the text from your article , Some times the description showed by the Search Engine was not attractive and you will lose your SEO traffic . Chapter 6 : How To Analyse Your Blog Using Adword Analysing Tool . I hope you will understand this topic , If you have any kind of doubts related to this article don't forget to comment us . It is very easy to start a blog on Blogger because it is one of the simplest blogging platforms ever by Google. Every famous bloggers were started their blogging journey from Blogger. In My case too. I think this is the best user-friendly platform for every beginner. Through this article, I am going to teach you, How to start a free blog on blogger. Starting a blog with Blogger is very easy. You don't need to know any kind of programming language or web hosting technics. All you want to do some basic computer skills. So, let's start. Go to Blogger first and log-in by using your Google A/c. It will ask you to fill some profile information. If it asks, just fill it out and go forward to the next step. On the Blogger Dashboard, Click on the Create blog. Then you can see a window appears like below. In the "Title" Box, Enter the Name of your blog and in the "Address" Textbox enter the URL address of your blog. From the "Theme" Selection box, Select you a theme for your blog and click on the "Create Blog" button. The above step will help you to create your first blog. The next step is to configure the settings and learn about the basic of blogger. So, go to the next chapter by click on the link below this paragraph. Also, read the related articles. Chapter 2: Learn About The Basic Settings and Configuration of Blogger Blog. How to Find Information About a Person Who Behind an Email. How to Make a Web Forum Success With in 30 Minutes. I hope you well enjoyed this article. If you have any doubts or suggestions that related to this article. Please let us know by using the comment box that given below. You can also use My FB page to ask questions. We know that there is about 20000 Email A/c where hacking per a day , Actually we don't know how the hacker's getting our password to get in to our Email A/c . Some times they using any kind of keyloggers or spy to get our password , The main issue of password hacking because we don't using any kind of Antivirus in our Pc . If we use any premium Antivirus in our system it will prevent almost every spy virus they attack's our system . Gmail 2-Step verification method is the new security system introduced by the Google Company , By using 2-Step Verification system we can prevent the hackers hacked from our Gmail A/c . By activating the 2-Step Verification on your Gmail A/c , When you get into your Gmail A/c or any other A/c by the Google ask you two verify your login by verifying a SMS . Through this you can prevent your Gmail A/c from the hacker's who know your password , The hacker's can't use your Gmail password unless they have your cell phone or sim to verify the SMS . Enter to : http://www.Google.Com . You can see your Avatar on the top right side of the Google Search Engine . Click on the "Avatar" Then click on the "Account" . On the new page click on the "Security" . On the "Password" Section you can see the "2-Step Verification". Enable the "2-Step Verification" . Click on the "Setting" and set your "Primary Phone number" and "Backup Phone number" to receive SMS . Generate "Backup Codes" for verify your Gmail A/c when you are at other country's or Travel . It is because , If you lost your Primary mobile phone or cause any Damage to your sim , You can use your Backup phone number to login to your Gmail A/c . If you lost both your Primary phone and Backup phone you can use the Backup code to recover your Gmail A/c . Gmail will not ask you to verify the SMS every time , If you or any other person try to login to your Gmail A/c from a Unknow Pc . You can set your regular using Pc as a trusted one in 2-Step Verification Method . Log in to your Gmail A/c using Google Chrome . Verify the verification SMS sended by Google . On the verification success page you can see a checkbox to make your PC as trusted one . Get in to your 2-Step Verification Settings then click on the "Registred Computers" Click on the "Required Code" Finally click on the "Remove This Computer From My Trusted List" . We know that almost every people in the world wide web where joined on Facebook . Only few people were not un joined on Facebook , They just getting a way from Facebook because of any reason . We people always trying to share our Photo's and updates through Facebook for getting like and comments for our Facebook Post's . But we can't share our Facebook photos and updates for the un joined friends in Facebook . Through this article you will learn about "How to send your Facebook updates to your friends via Email Newsletter" . Kidpost is a small social media site for sharing our Social Media updates through Email Newsletter , By using Kidpost we can send our Facebook , Twitter , Google Plus , Etc updates via Email Newsletter . To work with Kidpost you need to register a A/c with them , When you trying to register with Kidpost the Kidpost Registration for ask you to connect your Facebook and all other Social Media's . Also ask you to add the list of email address to receive the News Letter's . Kidpost not share each and every post from your Facebook and other Social Media's , You need to you need to tag Kidpost on your Facebook post to share them via Kidpost Email Newsletter . Use #kidpost to tag Kidpost on your Facebook Post . You can use Kidpost as a privet option to send regular updates through Facebook and other Social Media's . You can add or delete email list any time by login to your Kidpost A/c . I hope you well enjoy this topic , If you have any suggestion about this topic , You can write them on the comment box , Also if you like this post don't forget to share this post with your friends by clicking the social buttons given below .